The ITER Organization and the Spanish company Equipos Nucleares S.A. (ENSA) signed the contract for the welding of the ITER machine's nine vacuum vessel sectors and 54 port structures on Friday, 30 November 2012. In addition to on-site welding and testing operations, the contract—which is worth EUR 74.5 million—includes the development of specialized welding and testing tools. 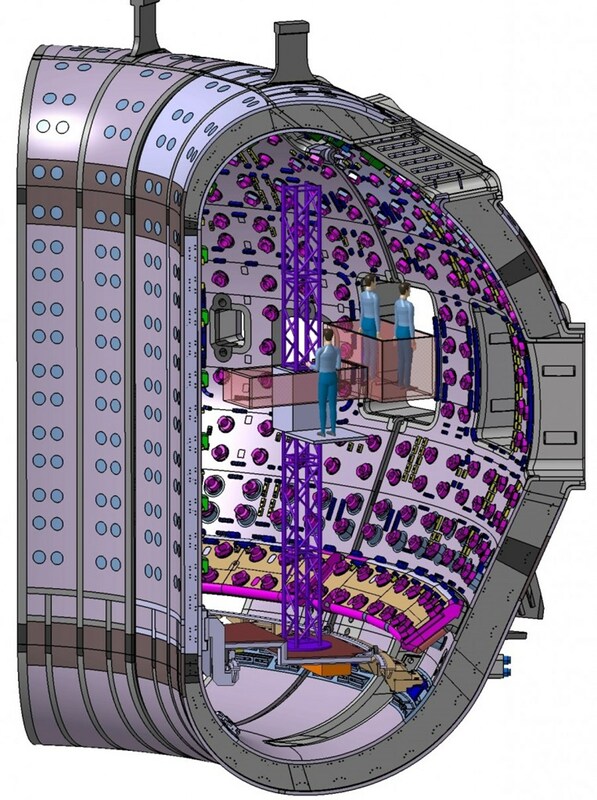 More than 150 people, including highly skilled welding and testing personnel, are expected to be involved in the task to complete the field joint welding and testing on the ITER site over a time-span of four years. ITER's vacuum vessel is a torus-shaped, double-walled structure made out of 60-mm-thick, ITER-grade austenitic stainless steel. The vacuum vessel will be manufactured in nine sectors (two by Korea and seven by Europe) and delivered to the ITER site. The nine vacuum vessel sectors will be sub-assembled with thermal shielding and toroidal field magnet coils before being positioned in the machine pit by crane. Ensa's Managing Director Rafael Trivino and ITER Director-General Osamu Motojima at the signing ceremony last week. Each vacuum vessel sector must be aligned and welded to the other sectors using a Narrow Gap TIG (Tungsten Inert Gas) welding process. 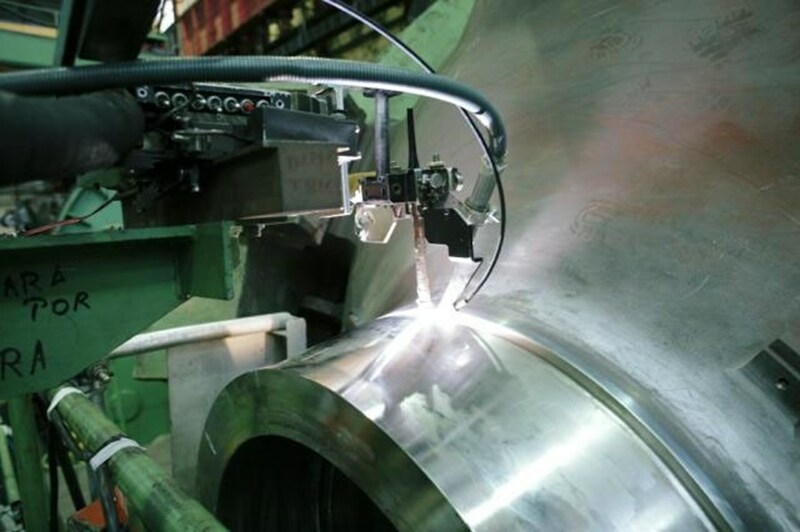 Welding will proceed by triplets: three sectors will be welded together to form a triplet; three triplets will then be aligned and welded together quasi-simultaneously. 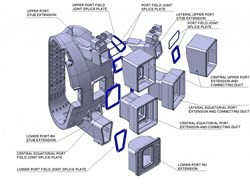 The nine sectors will be connected via inner and outer splice plates. These will be custom machined to accommodate dimensional differences between the vacuum vessel sectors and to facilitate their relative alignment. The splice plates will also allow access between the sectors prior to welding in order to first connect the joints between the silver-coated thermal shields that surround each vacuum vessel sector. The nominal width of the splice plates is 160 mm on the inner shell and 100 mm on the outer shell. The contract for the welding of ITER's nine vacuum vessel sectors and 54 port structures was signed with Equipos Nucleares S.A. (ENSA) on Friday 30 November. In the ITER machine, because the thermal shielding completely restricts access to the outer shell of the vacuum vessel during assembly, it will only be possible to access and weld these joints from one side, whereas normally such welding would be performed from both sides. Access is so difficult that narrow welding torches will have to be developed. Robots will deploy the torches in areas where man-access is not possible. 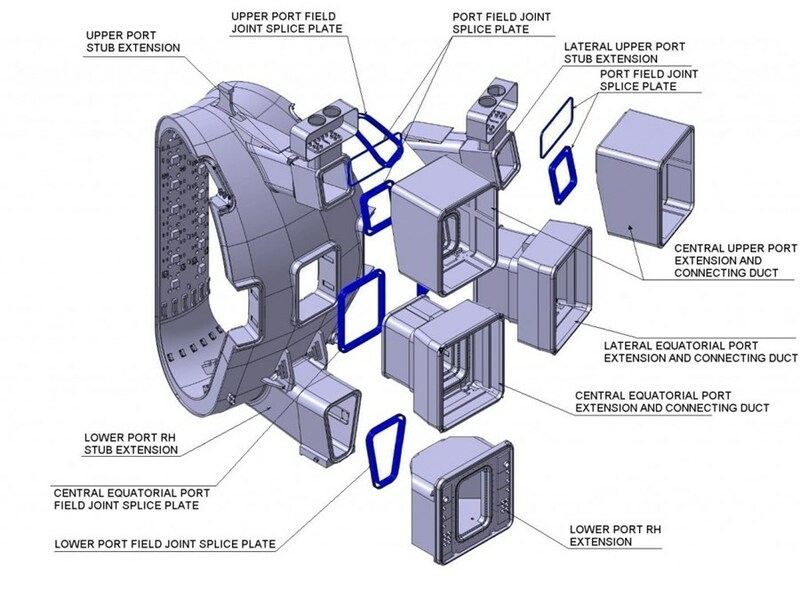 It is estimated that welding operations for the ITER vacuum vessel will require the manpower of 150 specialists working in two daily shifts over a period of four years. At the end of welding operations—in addition to non-destructive examination technologies such as radiography and ultrasound performed by ENSA and its sub-contractors—the ITER Organization will perform vacuum leak testing and pressure testing. All welding and testing work will be independently monitored and approved on behalf of the French Nuclear Regulator by an Agreed Notified Body. It is estimated that welding operations for the ITER vacuum vessel will require the manpower of 150 specialists working in two daily shifts over a period of four years. The work on the vacuum vessel and the ports will be done in accordance with RCC-MR (Design and Construction Rules for Mechanical Components of Nuclear Installations, 2007) and the ITER Vacuum Handbook. ENSA is an industrial manufacturer with vast experience in the nuclear power sector. "We are very proud that the ITER Organization has awarded us this contract," said the ENSA Managing Director Rafael Triviño on the occasion of the contract signature. "We are grateful for this confidence placed in us and we are very pleased to have the opportunity to participate in this challenging and highly technological project that we hope will be followed by other significant collaboration opportunities in the field of nuclear fusion." 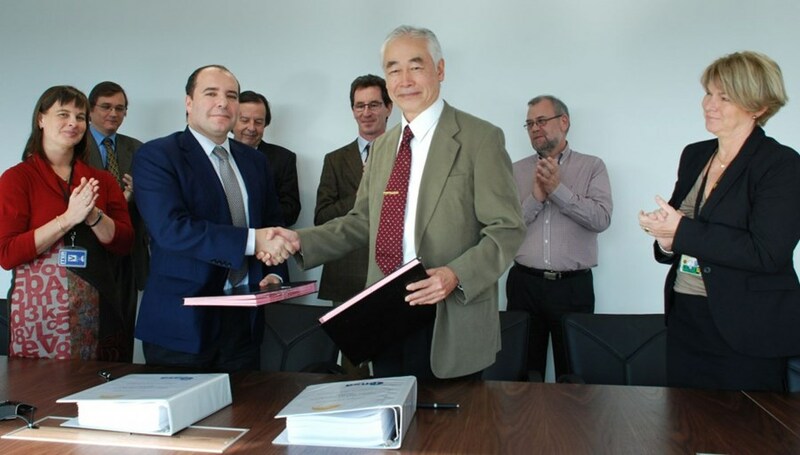 For ITER Director-General Osamu Motojima, the signing of the welding contract was a "landmark," representing as it does the first contract signed for the assembly of the ITER Tokamak. For the electronic version of the ITER Press Release press here.